Adam Denoyer and Bryn Booth play teenagers in 1966 Ireland in Brian Friel’s “Lovers” at the Scoundrel & Scamp Theatre. It’s 1966 in rural Ireland. Birth control is illegal and the Catholic Church is omnipresent. This is the world in which Brian Friel’s “Lovers, Part 1” is steeped. The heartbreaking and funny play is getting a compelling and moving staging at the Scoundrel & Scamp Theatre. 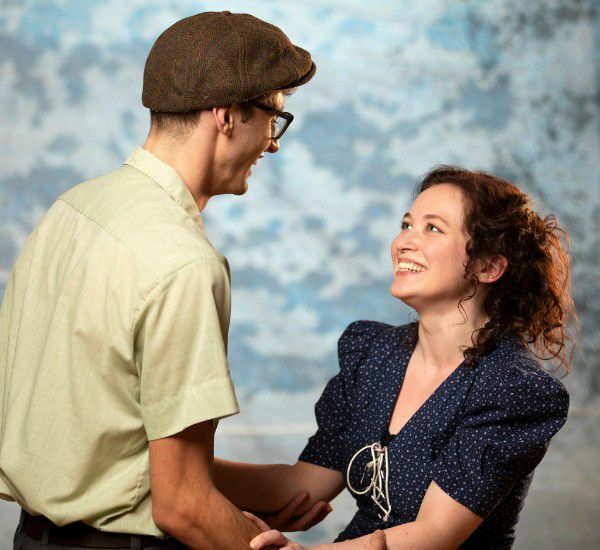 Maggie (Bryn Booth) and Joe (Adam Denoyer) are 17 and in love. She is pregnant. They have both been expelled from their schools because of the shame they have brought on themselves and their families. But they will be allowed to take their final exams. The young lovers meet on a hill overlooking the town with plans to study. Well, Joe plans to study; Maggie is not too keen on hitting the books. As we see the anguish and giddiness and hope and fear the two go through, a man and a woman (Claire Hancock and Christopher Pankratz) sit to the side near the front of the stage. They tell us what is in store for the two teens in a cold, dispassionate manner. We know quickly into the play that Maggie and Joe will meet their demise before their day ends. “Lovers” doesn’t have much of a plot. When you write like Friel, and have such strong actors delivering his poetry, you don’t need plot. What it does do is allow us into the lives of the teens, and to feel all the energy and earnestness and confusion that comes with being 17. As well as the oppressiveness of a country that is practically ruled by the Catholic Church. For the most part, Joe doesn’t hear — his focus is on his books — which may make Maggie feel safe about making herself so vulnerable. When Maggie takes a nap, it’s Joe’s turn to talk to her, baring his soul, as well. Several times, attention goes to our Greek chorus of two as they tell us about the teens and their families, the search for their bodies, the results of the inquest. Friel’s play is actually in two parts, the first, the one on stage at Scoundrel & Scamp, is “Winners.” The second, “Losers,” is about the empty love of a married couple. Of course the young teens who die are the winners — their lives ended when they were full of hope and love. Holly Griffith, in her directorial debut, shows a deep understanding of Friel’s work and the Irish world his characters inhabit. The production was spellbinding. The players, too, embraced the piece. Booth’s Maggie had boundless energy, and Denoyer was perfectly awkward. The dialogue felt completely organic in their hands. This is a wordy play, but they allowed the language to flow. Hancock and Pankratz were emotionless, almost still — perfect for the narration roles. All of them spoke with a sumptuous brogue that never wavered; that is quite impressive. “Lovers” ends Scoundrel & Scamp’s first season. And it ends it with a bang. See this, if you can. When: 7:30 p.m. Thursdays-Fridays, 2 p.m. Sundays through July 8. Where: 738N. 5th Ave. in the Historic Y. Tickets: $28, with discounts available.